McCOOK,TX- Hidalgo County Sheriff's Office arrived at the scene of an incident at an oilfield near McCook on Monday, Sept.25, 2017. Alton fire chief Javier Garcia confirmed that one person died and another was badly injured. 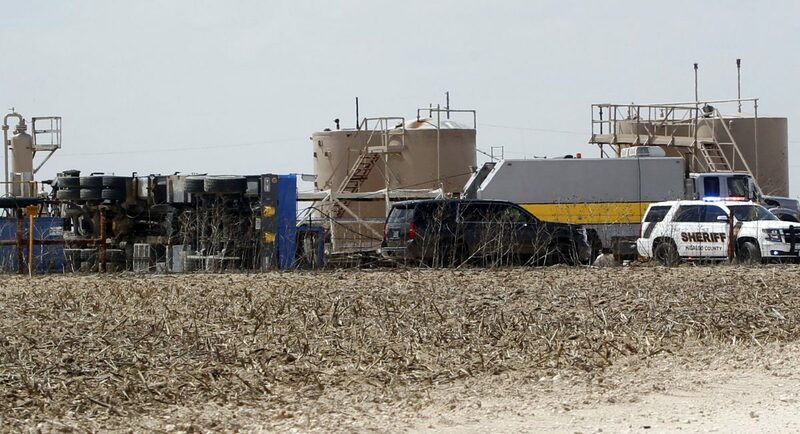 NEAR McCOOK — Authorities with the Hidalgo County Sheriff’s Office continue investigating the cause of an accident that left one oilfield worker dead and another seriously injured. Fire personnel and sheriff’s deputies responded to a call at about 10 a.m. Monday to an oilfield on North Moorefield Road and McCook Acres, where a large portion of an oil rig fell. Located near the top of the structure that collapsed was the individual who was “badly” injured, and has since been transported to a local hospital. The man who died was pinned underneath. The sheriff’s office is investigating the accident as an equivocal death, according to an HCSO statement which also confirmed that Justice of Peace Luis Garza had pronounced an adult male dead. 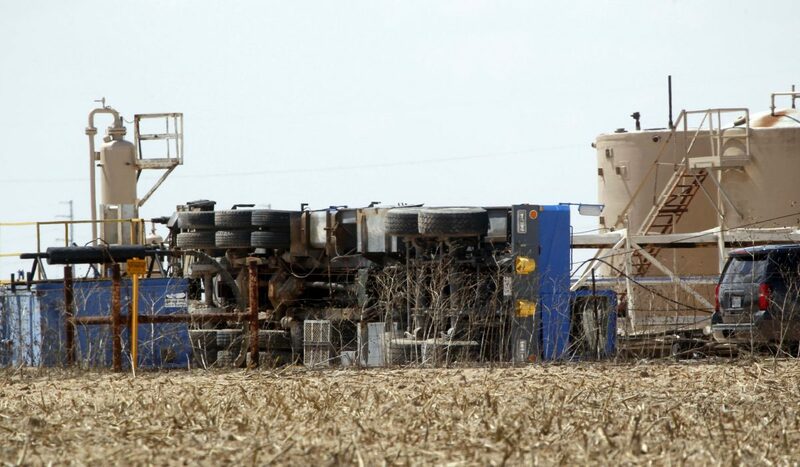 McCOOK, TX- A rig lays on it side after an incident at an oilfield near McCook Monday, Sept.25,2017. Alton fire chief Javier Garcia confirmed that one person died and another was severely injured. The accident occurred near the intersection of Moorefield Road and FM 681 near McCook. Calls placed to local OSHA representatives went unreturned as of press time. “(It) appears to be accidental but still pending autopsy results,” Palacios said in the statement. Alton Fire Chief Javier Garcia said the employees, who have yet to be identified, were working when the rig tipped over. Palacios would not release the name of the company in which the men were employed. The fire chief said there were no oil leaks or threat of danger as a result of the accident.